On Wings of Eagles: How Strong Are Your Habits? There was a fire one night at a convent and several nuns who lived on the fourth floor were trapped. They were praying for divine providence to show them a way out of the fire when one of the sisters screamed, "We need to take off our robes, tie them together, and climb down to safety." Later as they were recounting the event to reporters, they were asked if they were afraid that the crude rope might not hold up. "Oh, no," they said, "Old habits are hard to break." Do you know the story of the touchstone? It tells of a fortunate man who was told that, if he should find the "touchstone," its magical powers could give him anything he wanted. It could be found, he was informed, among the pebbles of a certain beach. All he need do is pick up a stone - if it feels warm to the touch, unlike the other pebbles, he has found the magical touchstone. The man went immediately to the beach and began picking up stones. When he grasped a pebble that felt cold, he threw it into the sea. This practice he continued hour after hour, day after day, week after week. Each pebble felt cold. 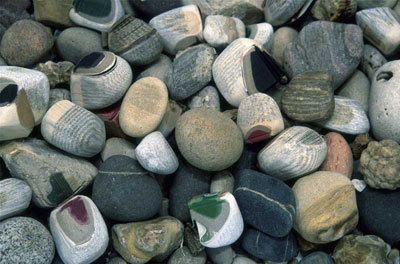 Each pebble was immediately tossed into the sea. But then, late one morning, he happened to take hold of a pebble that felt warm, unlike the other stones. The man, whose consciousness had barely registered the difference, tossed it into the sea. He hadn't meant to, but he had formed a habit, and habits can be hard to break. Most of our habits are more like routines. We habitually arise about the same time every day - too early, it seems. We exercise. we fix oatmeal for breakfast. Most days we listen to the same kinds of music and even read the same kinds of literature. Our routines include those places we like to visit and the people we like to see. It's all fairly predictable. But what we call routine is more like a series of habits, some of which work well for us and some we should perhaps look at a bit more closely. In fact, any behavior that we repeat, we reinforce. If we repeat it often enough, it becomes habit. Soon we don't even think about it -old habits are hard to break. Even good ones. A Spanish proverb says: "Habits are first cobwebs, then cables." The metaphor works well for "bad" habits. They first entice, and then ensnare us like a cobweb. And if we continue in the behavior, the web grows stronger and can be as difficult to break as a steel cable. But some habits can work in our favor. Such as patterns in the way we live our lives. Or positive attitudes and healthy ways of thinking. Our habitual attitudes and behaviors can either help us or hinder us. The truth is this: we form our habits, then our habits form us. So we ought to pay attention to the habits we're forming. Is there a behavior or attitude you would like to make into a habit? Then reinforce it by repeating it at every opportunity. Is there a something you wish to change? Then substitute a different attitude or behavior and repeat the new one every chance you get. When it comes to habits, practice may not make perfect. But practice will certainly make permanent. Your habits will form you. So form the habits you want and let them mold you into the person you want to be. Dear Lord, we pray today for habits that are good habits. Help us start with one good habit and build from there. In Jesus’ Name, Amen.